Have you ever had the desire to lose your free will? Or, alternatively, have you ever had the desire to take someone's free will? Now you can with our new "Human-Human-Interface Experiment." In a continuation of our 1) Neuroprosthetics Experiment and 2) Muscle SpikerShield Experiment, you will learn how to use your muscle signal to control other devices, in this case, a TENS (transcutaneous electrical nerve stimulator) to excite and contract the muscle of another human. Note: A TENS unit by definition delivers enough current to cause muscle contraction. Do not place electrodes across the muscles of the throat or the chest. This experiment is appropriate for college students. Adult supervision is needed for younger (high school) users. We have previously discussed "neuroprosthetics," that is, designing a machine that interfaces with living neurons to control a device or for sensory substitution. But what about muscles? If people have damage to their spinal nerves, the muscles themselves can be stimulated, and this line of research is called "functional electrical stimulation." For example, functional electrical stimulation can often be used to help someone stand up, or to improve walking by helping to swing a foot forward. In addition, if someone has an artificial limb, such as a robotic arm, they can use the electrical activity generated by the electromyographic signals in their pectoral muscles to control the motors and control systems in the robotic arm. A notable example is Jesse Sullivan, who lost his arms during an electrical installation. There is also a company called RSLSTEEPER that has developed a bionic arm called the "bebionic3" which functions on very similar principles, but uses muscular activity in the amputee's stump to control the wrist and hand movements. 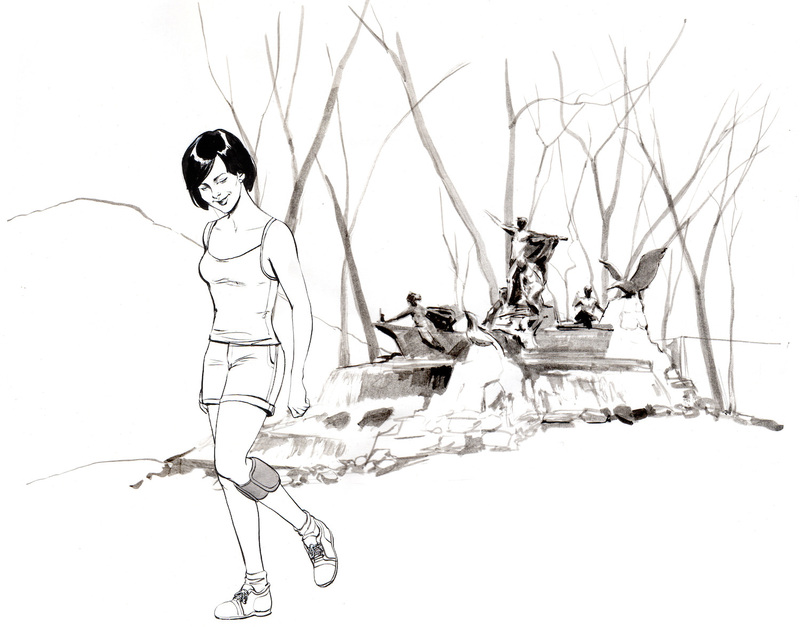 Fans of the RoboRoach have often asked us: "When will you get this working on humans?" We responded and solved this customer request by launching our "Society" invention. But many people were left unsatisfied. They wanted something more direct. If you like who is controlling you, the feeling can be quite nice. 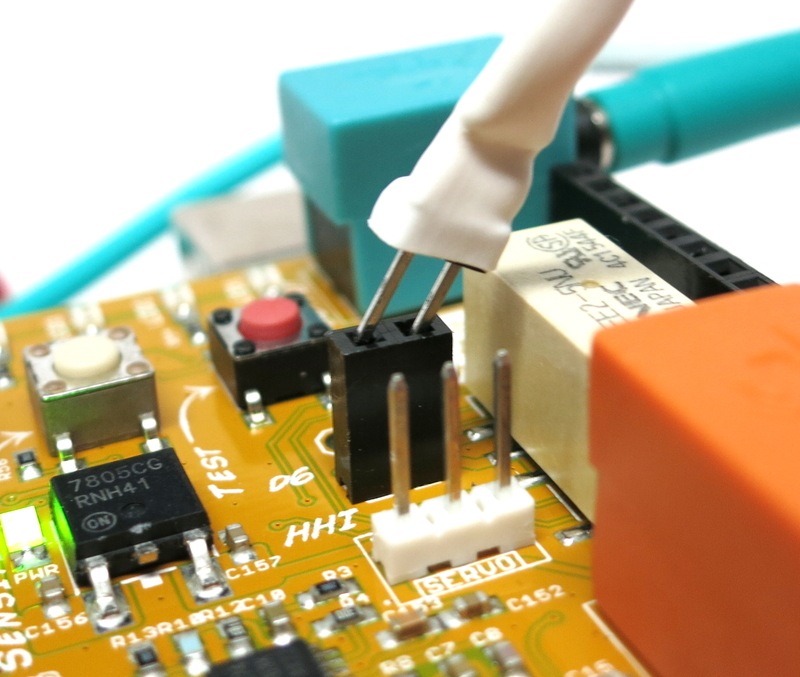 Plug the orange electrode cable into the SpikerShield. Place two EMG electrodes on the forearm, one on the back of the hand, and clip on the EMG cables using the alligator clips. Reds on the forearm muscle and black on the back of the hand. Now, have the controller flex their forearm muscles. With a sufficient strong flex, your controller should be able to light up all the LEDs, just like the Muscle SpikerShield experiment. **Note** Press the white button directly below the LEDs to change the sensitivity level to make it easier or harder to light up the LEDs. Now you are ready to hook up the "Controlled Human." First, you need to set the frequency of the TENS device by sliding down the front face of the black TENS device: we set a ~50-80 ms pulse duration and a 10-20 Hz frequency. Plug the Tens cables male header pins into the Muscle SpikerShield Stimulator output. The TENS device included with the HHI has two channels, but we'll only be using one. Take note of which side you plug your cable into; you will use the knob on that same side to control the gain, or power, that the TENS device will output. 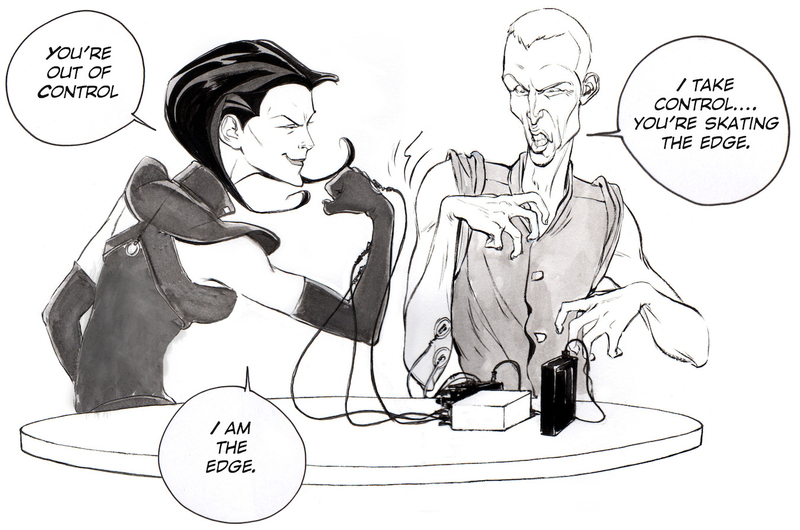 Have the Controller keep flexing, and slowly begin to turn up the power of the TENS device until you see a response. We typically see responses around settings 3-5. To disarm the experiment, first turn off the TENS device totally. Then have the Controller remove their electrodes, and finally, free the controlled from their clips. **Important** If the Controller pulls their electrodes off before the TENS device is turned off, or the controlled is set free, it will cause the circuit to short and constantly send stimulation to the controlled. Avoid this! Happy hacking! Let us know what you connect your EMG signals to! Let your creative mind flow and invent. We receive a lot of questions regarding this experiment, and we collect some of the most common. Can you achieve more full control, like say, an entire limb? 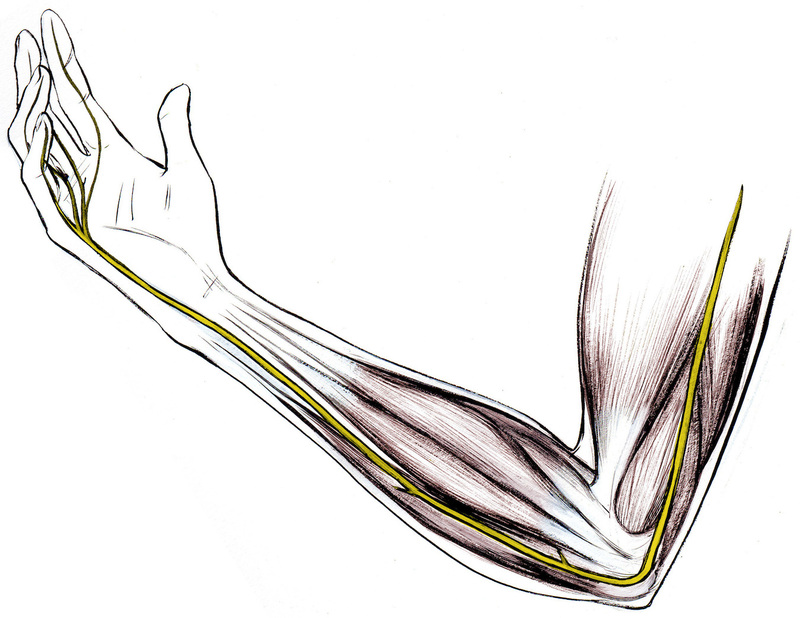 These experiment works because the ulnar nerve lies just below the surface of the skin in your forearm and elbow, and it is relatively easy to stimulate. 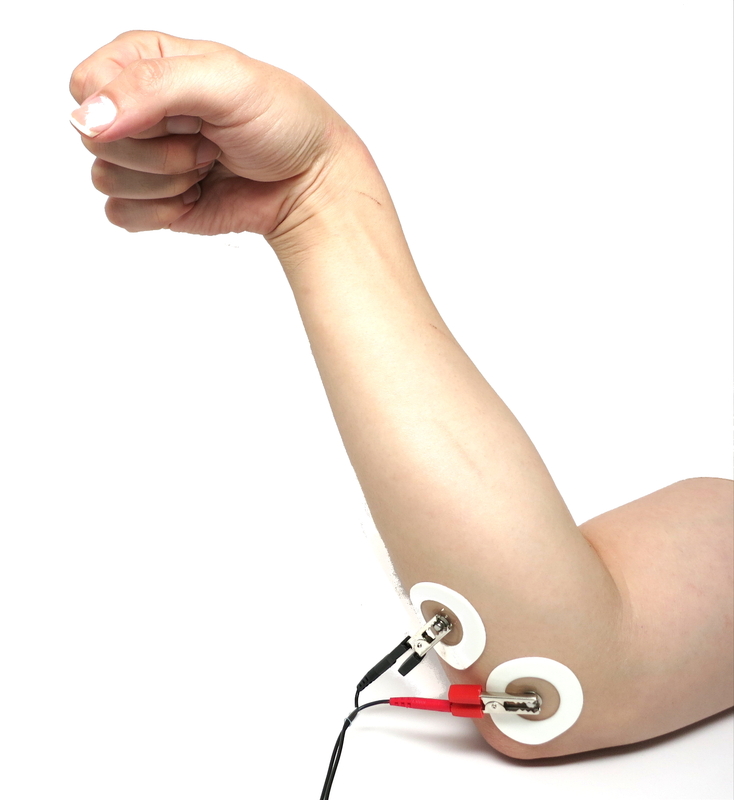 Putting the electrodes in other places on the arm stimulates the muscles more than the nerves. 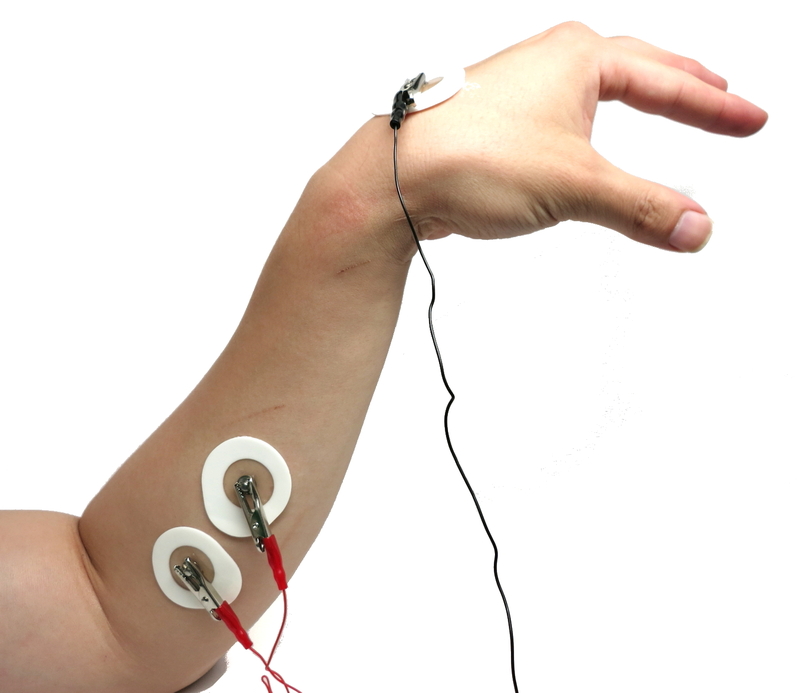 While someone could place more pairs of stimulating electrodes on the arm, the movements will always appear "jerky" due to stimulation thresholds and types of muscle fibers activated. Can you control another person by using your brain waves (EEG) instead of muscle electrical activity (EMG)? Some research groups have had success with analogous experiments, but the set-up is more complicated and susceptible to false positives. 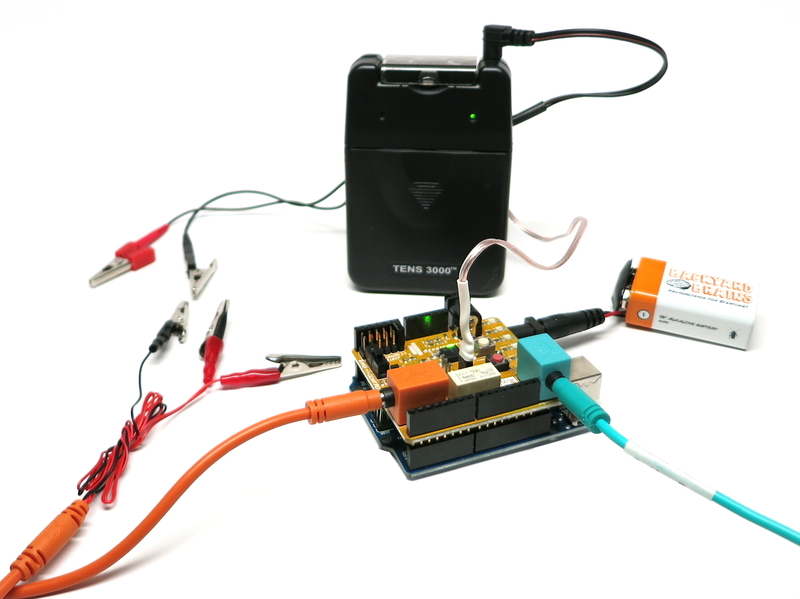 EMG is much easier to amplify and control things with. If your device is not working, try these solutions first! If the LEDs are not lighting up at all, and/or if you only have one blinking red light, you may have accidentally reset your Arduino! If this happens, reupload your code to the device. Look under the Downloads section above for instructions. If you are having trouble getting all the LEDs to light up with your flexing, there are two options: 1) reposition the muscle electrodes - 2) lower the thresholds in the code. This setup is only one channel, but you can stack the Muscle SpikerShields to have up to three analog input channels (and our TENs unit has two output channels!). If you have two degrees of output control and three input control signals, do you think you can cause more sophisticated movements? We've noticed that some people respond at lower or higher stimulation levels than others. What factors could you measure that may affect the level of someone's response to the same level of stimulation-age? Gender? How regularly they work out? If they're tired or not? What other movements do you think you could induce with the Human-Human Interface? Remember to consider the earlier warnings about safe use of a TENS unit. Some suggestions-the medial nerve (another nerve in your arm), the patellar reflex (your leg moves when the center of your knee is hit), or trying to get individual fingers to move. The stimulation of the muscles with the TENS, while interesting, is not nearly as elegant and smooth as the natural movements you can make with your own volitional control. Why do you think this is? How could you compare the two in an experiment? Which do you think would be stronger-your natural movements or those induced by the huge amouont of current coming from the TENS? While this is a fun neuroprosthetic demo for public and classroom demonstrations, what would it take to make this a useful device for the clinic? We make tongue-in-cheek jokes about "controlling humans" here in this experiment, but what do you think it would take to fully control movements?